Established in 1983, Westbank First Nation opened an intermediate care facility that provided quality care for community elders, both native and non-native. While originally designed to provide residence to aging residents, we have since changed our operating model to provide services to residents requiring complex care, including dementia care. Pine Acres has grown and evolved since opening in 1983. Additions to the building and services provided occurred in 1988 and 1994. There are currently 63 beds for residential care. Pine Acres Home has implemented a Resident Council with bi-monthly meetings, and family members are encouraged to attend. 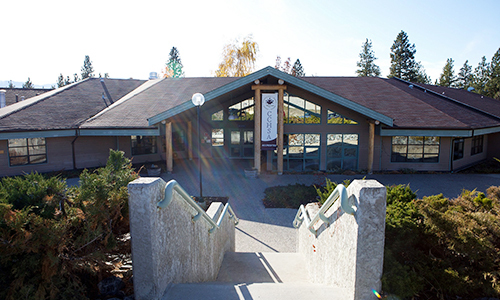 Our facility is distinguished for its approach and commitment to First Nations cultural and spiritual beliefs. Mission: Pine Acre Home promises excellence in care in a safe, nurturing environment. Vision: Pine Acres Home will be a national leader in providing excellence in care to all cultures in a First Nations environment. Pine Acres provides excellence in care in an Indigenous environment. We work closely with the Interior Health Authority ("IHA") and Indigenous Services Canada. Forty beds are funded through IHA. Priority for placement is given to First Nations residents for the remaining twenty beds. We believe that by attempting to meet your needs and interests, we have the potential to promote an active and meaningful life for residents, and, in doing so, provide residents with satisfaction, self-worth, and assistance in maintaining their independence. The facility employs 24-hour professional nursing care consisting of Licensed Practical Nurses, Health Care Workers, and an Activity Department supported by volunteers. Registered Nurses in Administration provide clinical leadership and education. Prepared on site and served by Pine Acres food service staff. Food services range from regular nutritious meals and snacks to special diets and food for special occasions. Two seasonal rotating menus change in spring and fall. Likes and dislikes are considered. Beverages and snacks are provided between meals, at mid-morning, mid-afternoon and before bed. Family and friends are welcome to join for meals. Meal tickets can be purchased from the office, Monday to Friday, 8:00am to 4:00pm. A small private family dining room in the Quail Unit is available for family and friends. The Recreation room can also be made available after hours for a larger or extra special occasion. Provided on site at no charge. Laundry department will not iron or repair clothing or be responsible for clothing that requires special attention. Visits by a foot care nurse are available approximately every 6-8 weeks. Assess and treat problematic corns and callouses at a cost. If a resident has diabetes or poor circulation in their lower legs, it is important that their toenails are trimmed by a specialist. Annual oral screening Dental Hygienist visits every 4 weeks, on a fee for services basis. Laboratory technician comes to Pine Acres weekly. Interdenominational services held each week. Requests for particular clergy visits may be made. Monthly calendar with a wide range of planned and spontaneous programs that accommodate cultural heritage and levels of interest and abilities. May involve small or large groups or be one-on-one. Wheelchair accessible bus used for outings in and around Kelowna such as scenic drives, outside social functions, shopping trips, lunch outings, etc.